This is one of our very favorite weeknight meals. I know that homemade bread sounds intimidating. But if you have a stand mixer, it's one of the easiest things to make, and is so popular with kids. Since I use a lot of whole wheat flour, and all natural ingredients, I feel really good about serving this for dinner along with eggs or cheese, and some fresh salad. It's one of the few dinners that ALL the kids enjoy. I have a few bread recipes but this is the one I return to most often because it's easy and always works. It's from Molly Katzen's Enchanted Broccoli Forest , one of the most well worn books on my cookbook shelf. Please use dry yeast for this recipe, even if you normally use fresh. It's so much more reliable. I buy it in bulk at Costco and it lasts for months in the fridge. Be sure not to use the Rapid Rise variety. Just the ordinary dry yeast. First, make the sponge: In a large mixing bowl, dissolve the yeast in the water. Stir in the honey or molasses. Let it sit for a few minutes till it's bubbling and then stir in the flour with a whisk or wooden spoon. Let the sponge sit, covered with a clean dishtowel, for 45 minutes to an hour. If you have more time, you can put it in the fridge for a couple of hours. When you're ready, add the remaining ingredients to the bowl in the order listed. Use a stand mixer to knead the dough for about 5 minutes till it's nice and smooth. You may need a bit extra flour - add it if you think you need it, just a little bit at a time, till the dough is smooth and doesn't stick to your hands. Take care not to add too much, though, or the dough will get dry. Cover the dough with a clean dry dish towel and allow it to rise in a warm spot (I use my bedroom, the warmest spot in my house!) for about two hours (more or less). Grease two loaf pans well with oil, margarine/butter, or some Pam. Divide the dough in half and use a rolling pin or the palms of your hands to flatten each half into a rough oval shape about 8 inches wide in the center. Then, just roll the oval up jelly-roll style (lengthwise) and place it into your prepared pans. Let the loaves rise for another 45 minutes or so. About 15 minutes before baking time, preheat the oven to 375* and bake for about 45 minutes, till the loaves are golden and sound kind of hollow when you tap them. Cool the loaves on wire racks (this is important; they will get soggy if you let them cool in the pans) for at least 1/2 hour before serving. Note that this bread freezes wonderfully. Just wrap them well in foil after they have cooled thoroughly and freeze for up to a month. When you're ready to use them, unwrap them and let them sit at room temperature for a few hours. Warm up in a 350* oven for about 10 minutes to refresh the bread. See my post on Yeast Spotting. Is there no flour in the sponge? Oh, thank you 'anonymous!' I messed that up and left out the flour from the sponge ingredient list. Thanks so much for catching that. 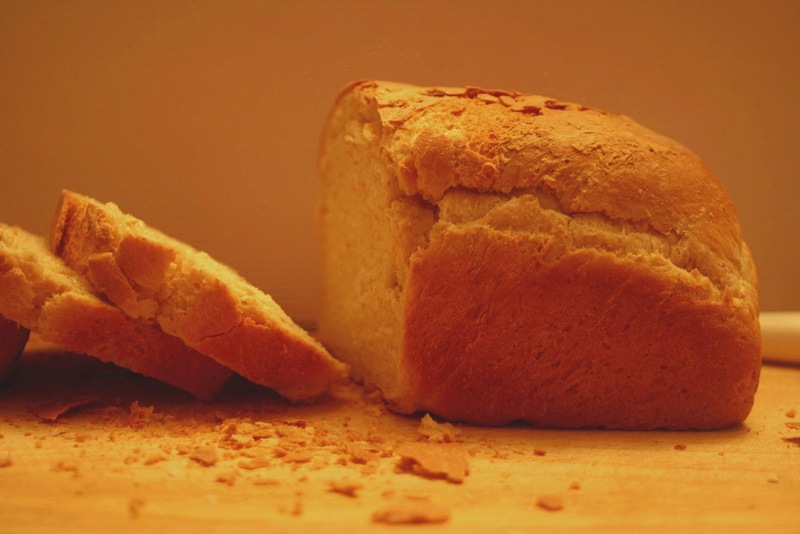 Sponge is a mix of yeast, water, and flour which you mix into the dough. It gives it a slightly richer flavor. My biggest challenge with this recipe is planning a Sunday around the steps so that I don't end up with a rising sponge or dough sitting for 4 hours. We didn't manage to do it last Sunday, but we'll try again this week. Is there any wiggle room in the timing, or does 45 minutes mean exactly 45 minutes? This recipe is not at all finicky so there's a lot of room to play with it based on your schedule. I wouldn't leave the sponge rising for more than 1 1/4 hours, but if you need to leave it longer, you can put it in the fridge for a couple of hours or even overnight. (I have also let it rise as short as 20 minutes in a pinch.) A longer rising time for the sponge will give it a little hint of sourdough taste, which you actually might enjoy. For the dough, you can increase the rising time to 2 1/2 hours or so, and for the loaf, you can increase it to about 1 1/4 hours. (If you need to cut the rising time, put it in your oven at the very lowest temperature, probably 175*, covered with foil, and cut the rising in half.) Again, you can refrigerate at any of these points if you need to. If you do refrigerate the dough before forming it into loaves, let it come to room temperature for an hour or so before working with it. Hope this helps! Let me know how it turned out. Here's the update on Nechama and Uri and Yisroel's Excellent Breadventure: My 15-year-old stand mixure handled the sponge but rebelled after about 3 cups of flour. It just wouldn't turn. So I dumped the dough onto a cutting board and tried kneading by hand, but I can't say I did a great job. The dough was more like a pile of stuck-together bits than a smooth lump. My daughter shaped the results into loaves and we baked them. Forget about waiting 30 minutes - one loaf was gone about 15 minutes after it came out of the oven. Homemade bread is like chocolate. Even when it's not perfect, it's pretty good. We ate most of the second loaf, too, and the consensus was that this is a recipe to make again - after we fix the mixer. Nechama, I'm so pleased that it worked out. I was worried about you - thought you might go hungry after all that effort. I have a couple of other bread recipes on this blog and my other one. Hope you fix your mixer and try another one! And I totally agree - homemade bread is like chocolate. Well said!